Indonesian vice-presidential candidate Sandiaga Uno on Friday dismissed concerns about the human rights record of his running mate Prabowo Subianto, saying the accusation only surfaces during election years. A group of 23 students, activists and critics were kidnapped by soldiers from “Team Rose” — an infamous unit of Indonesia’s special forces led by Prabowo, then a three-star general — during the twilight years of former strongman Suharto’s 32-year rule in late 1997 and early 1998. Suharto, the former father-in-law of Prabowo, was forced from office in May 1998 after months of student-led protests that plunged Indonesia into chaos — an event known as the country’s Reformasi [Reform] era. Prabowo was dismissed from the military during that time, and the kidnapping cases have never been resolved — despite incumbent President Joko Widodo’s promises to address past human rights cases. Prabowo, 67, is facing Widodo, 57, in this year’s presidential election, scheduled for Wednesday. “We’ve already had five governments [since Reformasi]. They all had the chance to prosecute [Prabowo]. 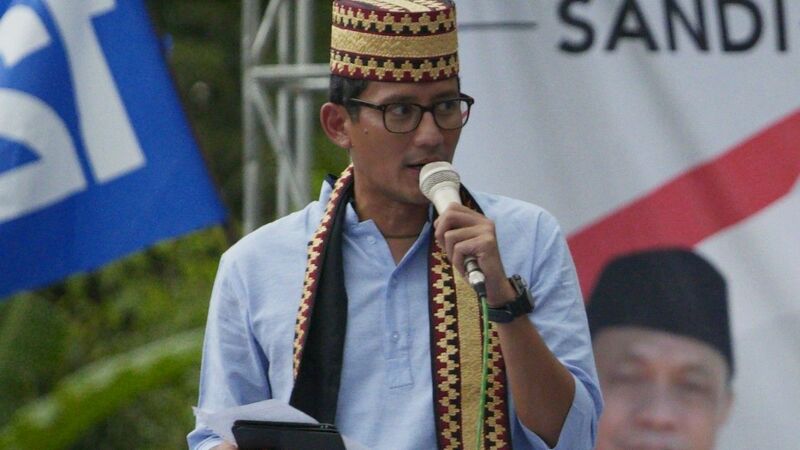 No one has done anything, including the current government,” Sandiaga told This Week in Asia after a campaign in the city of Bandar Lampung, south Sumatra. “People believe that it’s a five-yearly issue. What matters is how we can listen to the people, be authentic, and fight for what they want the government to focus on — which is jobs and prices [of staple goods],” he said. During the first presidential debate in January, Widodo had alluded to Prabowo’s human rights record by saying people should support him and his running mate, Muslim cleric Ma’ruf Amin, as he had no “past burdens” of rights controversies — a claim that had been criticised by activists. “People should look into [candidates'] track records. I don’t have past burdens, I don’t have any of those. I repeat, I don’t have burdens from the past,” Widodo said to loud cheers from his supporters. Asked about the amount he has spent on the campaign, Sandiaga, a successful entrepreneur with a wealth of $349 million, did not confirm the $100 million figure reported in a recent Bloomberg article, saying that it was “speculation”. “I’ve told everybody I will spend as much as I need to get us competitive, and we are now very competitive,” said the vice-presidential candidate. He confirmed he had sold some of his shares in private equity firm Saratoga Investama, which he co-founded in 1997, and was satisfied the “sums spent for the campaign are well-spent”.